On Tuesday 22 January, the LSE Volunteer Centre will be collaborating with the LSE Student Division of Lawyers Without Borders to bring students a one-off volunteering session to transcribe anti-slavery manuscripts. 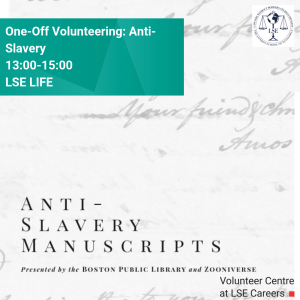 The session will run from 1pm-3pm in LSE LIFE, and is a chance for LSE students to get involved in discovering the correspondence between anti-slavery activists! What is Lawyers Without Borders? Lawyers Without Borders (LWOB) is an international non-profit organisation that harnesses the work of lawyers around the world towards rule of law, capacity building, and access to justice initiatives. Projects that the organisation works on range from trial advocacy training and mediation training, to policy guidance and various forms of community outreach. All of which provides invaluable opportunities to promote the significance of the rule of law, while encouraging discourse about human rights related issues. What is the Student Division? As a student division of the parent organisation LWOB, the LSE Student Division see this event (transcribing anti-slavery manuscripts) as a fantastic opportunity to promote the rule of law and uphold access to justice in our own capacity. Slavery is undeniably a tragic and pressing issue that deprives humans of dignity and liberty. Thus, they believe it is crucial to play a part in keeping it’s history alive and to prevent slavery from occurring, and a part of this involves ensuring that archives are updated, and that transcripts are accessible. Why did you choose to volunteer your time to LWOB? “I personally decided to run for President for Lawyers Without Borders after serving as Public Relations Manager for a year. The society had only been established for two years at the time I ran, and I was intrigued by the capacity for the society to develop, as well as the international reach of the organisation. The organisation’s projects currently span across three continents; projects include educating law enforcement agencies about human trafficking and wildlife crime, as well as indexing and transcribing case law to online platforms. In this sense, the organisation’s transcription work is quite similar to our anti-slavery transcription event. If you are interested to get involved with LWOB or find out more about the society, you can reach them via their Facebook Page: Lawyers Without Borders Student Division at LSE. If you have specific questions about the organisation or the student division, the committee will be at the event and happy to answer questions. Please sign up for the one-off volunteering session on CareerHub! If this has inspired you to volunteer, check out one of our other 200+ ongoing opportunities or book a one-to-one with David Coles, the Volunteer Centre Manager if you have more questions. If you are short on time, then take a look at the one-off opportunities taking place in Lent Term organised by the LSE Volunteer Centre. And why not follow us on Facebook, Twitter, and Instagram to stay up-to-date with our events and opportunities and read our blog for more volunteering tips and stories. Tuesdays 10-11am & Fridays 2-4pm. Book an appointment through LSE CareerHub.